There has been an incessant debate over this topic online and offline. 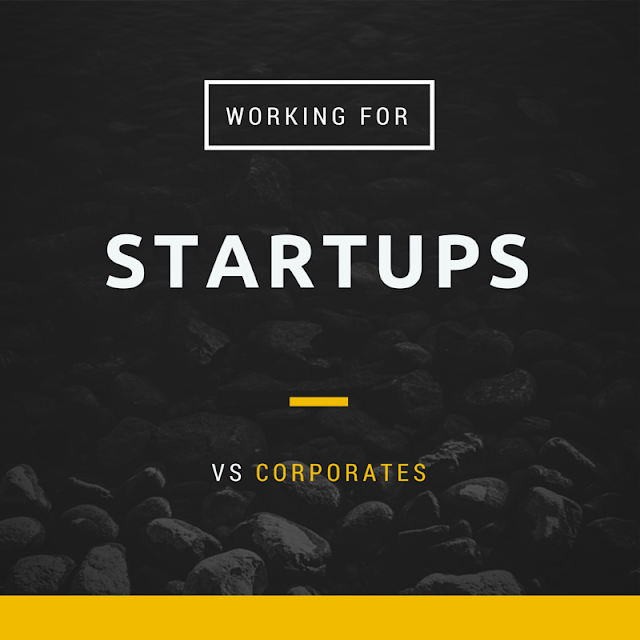 By now you probably know the criteria of each type of workplace: Startups are flexible while corporate organizations have a rigid timing. Corporates offer perks in terms of timely appraisals and bonuses, startups offer the freedom to work as per your convenience (you get free food and travel). However, what people forget to deliberate on is whether a corporate job or a startup is better for your career in the long run. Just think about it. A startup will give you the freedom to work as per your requirements, but will it give you the opportunity to proceed to a higher management position in future? A corporate job can give you structured training but can it provide the creative thinking skills that are required for personal and professional growth? After having worked in both environments, I have come to the conclusion that they both have their respective assembly of benefits and shortcomings. So if you think you are confused about which path to take, consider these pointers so as to make the most of your decision. A corporate might pay hefty sums of money as compared to a startup, but there are some solid career-defining reasons to heed the war cry of a novel venture. Working in a startup means that you’re part of a small team, with responsibilities specific only to yourself. Nobody will have the same skill-set as you or tackle issues the way you do. For example, when I started working at a startup, although the core team was pretty much in place, there was a grave shortage of content writers to publicize the brand online. With my background of editing I was given full responsibility of a particular vertical, which tested my creative acumen in a great way. It would have been difficult to get the same opportunity in a corporate office. Am I the most important member of the team? Of course not. But am I an integral part of it? Definitely. And this is where you need to be right out of school. A Startup Dishes Out Less Money But Rewards Its Employees With An Incentive Based Program That Doesn’t Depend On Dollars. It Focuses More On The Opportunities Seized And The Skills Attained. Within A Few Months Of Working In A Startup, I Had My Name On Hundreds Of Articles, Infographics, And Videos That Made It To Big Banner Websites And Magazines. I’m Sure Had I Sought Out A Smaller Position In A Leading Corporation I Would Still Be Proofreading Text For Grammar And Punctuation. No Thanks. With Experience I’ve Learnt That In A Big Company It’s Fairly Easy For Your Hard Work To Go Unnoticed. However, In A Startup It’s Impossible To Hide For The Good And The Bad. If You Do Your Job Well You Will Get Credit Where Credit Is Due. On The Other Hand, If You Make A Mistake, Be Prepared To Be Reprimanded For It Instantly. Honestly Speaking, It’s A Good Thing. This Way You Will Be Loath To Make Mistakes And Will Strive To Eliminate Errors In Order To Avoid Disappointing Other Employees. Stay Focussed So As To Ensure That Your Failures Get Minimized And Successes Recognized. In a startup you will find new ways to find fulfillment rather than simply burning the money you earn. You will find great joy in doing and creating as opposed to consuming. With more energy, both mental and physical, you will be able to take on new hobbies and initiate your own personal projects for the growth and development of the company. Frugality can truly teach you the value and importance of ownership, hard work, and self-sustainability. Startups can give wings to your aspirations and the euphoria surrounding them has a high degree of conviction. However, future leaders have exceptional lessons to learn from working in an established organization as well. It is one thing to grow a company from $0 to $100 million, and quite another to sustain this number year after year in a profitable manner. The challenge that it poses for the employees makes for a very conducive learning experience. Although startups like Facebook, LinkedIn, etc. have grown to become huge successes, there are many others who do not survive to see the light of day due to their inability to follow core fundamentals. A well-established organization can teach you to build a business that lasts. You want to become a seasoned professional? Join a corporation. We all know that technology is a domain where anyone who becomes complacent has his days numbered. 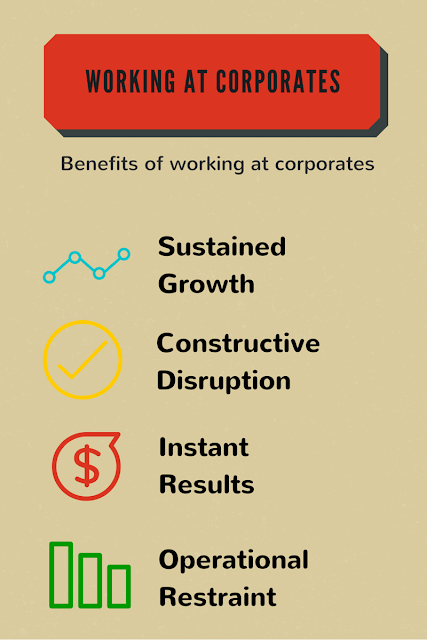 Established companies have realized that in a bid to survive and stay relevant, they not only need to stay competitive, but they must disrupt their normal mode of functioning as well in order to ensure continued success. The best example in this regard is Apple. They incorporated music into iPhone, thereby unsettling their iPod business. They then launched the iPad, disrupting their Mac business. By joining such a company you will be exposed to the complexities of organizational behaviour that will prove to be a huge learning ground. When you pitch an idea in a company and it takes effect, the response is massive which can be extremely gratifying. You have the ability to change lives overseas without stepping out of your office. In contrast, several startups are unable to launch change of such scale and magnitude. Most startups have exceptional operational discipline. However, what I found from my personal experience is that large companies have the best operational talent to offer. Since my strength is the creative, I have learnt immensely about how to operate efficiently in a global business. And trust me, the learning continues to escalate. It’s completely up to you decide which factors are essential enough to meet your targets on time. Will you do better with a “think outside the box” kind of mentality, or will you methodically work towards your goals in a structured environment? Neither is better over the other – just different in its own right. So whatever your verdict may be, just remember to keep your ultimate goal in sight and what you expect to accomplish in your career. This will not only keep you focussed, but will help you make sound decisions with every passing opportunity. You can also look for career guidance and job interview questions and that will also help you in getting a good job. Tina Jindal is a professional content writer who works on a variety of topics like employment, real estate, and education. A career advisor for naukri.com, she encourages the need of job oriented certification courses at e-learning.naukri.com and has been involved with renowned publications as well. You can contact her @Gmail | LinkedIn | Google+.